UPDATED AT THE END OF THIS PIECE FOLLOWING THE EFC AGM HELD 9th JANUARY 2018, BUT I STILL THINK MUCH OF THIS IS OK TO READ FIRST!! “Amortisation”. It’s got a lot to answer for in my view. Brilliantly explained by the ‘Esk’ of The Blueroom fame, amortisation has helped us mere mortal blues understand that despite some fairly robust appearances to the contrary, Mr Moshiri really has piled in £150m of his own money to serve and protect our beloved club. Sorted. Clearly explained. Simples. Yes? Well no actually, not simples at all. The theory and indeed practice of amortisation, even when coupled with clear ish interpretation of our often mystical, some might say whimsical, annual accounts does little for me when it appears to be discussed in isolation from the reality that is ‘football’. And by that I mean Everton football. The school of science. The People’s Club. Or ‘our club’ as most of us still like to call it, for reasons that will never ever have anything to do with accountancy. There’s a serious point in all that preamble. The esteemed Esk is reasonably boosting the impression that Mr Moshiri is creating the massive change in Everton fortunes we all dreamt of when he acquired 49.99999% of EFC or as it’s also known, total control without actual total control. The problem is that the accountancy is creating a dangerously skewed picture of our owners performance and priorities and in my view we should be really concerned because the very future of the club is every inch as tied to ‘football’ as it is to a new stadium, a neater balance sheet and support for the impact of ‘amortisation’ on a grand scale. Of course the new stadium is a huge plus, if it ever happens and yes this time it looks at least 70% likely. New quality players mean bigger wages and when spread over four or five years that means a big increase in the guaranteed financial support for running costs and that ‘guarantee’ has risen steeply in the last two years. Getting rid of the loan burden ? Well it feels like the proverbial no brainer doesn’t it ? Saves us, crumbs, the £5m a year it costs in interest. That’s just a bit under three months of Wayne’s salary. So here’s the thing. It’s all the wrong way around. It’s been said before but I don’t care I’m saying it again. Progress on the field was a better way to help than paying off a £50m loan and £6m in early repayment penalties. Progress on the field will mean that filling 60,000 seats in a new stadium is tinged with reality tho many of us still aren’t sure. Progress on the field, most notably right now staying the premiership, is way more important long term than a nicer balance sheet. It really, really is. This business genuinely isn’t like most others where amortisation is king. This business is genuinely different. You can have truly beautiful premises, with quality apparently built in to your delivery model, but if your sales are never in the top six products you are destined for a slow death where hope is occasionally raised but never produces real change, real progress. Such is Everton right now. Gross mis Mgt has delivered two lost decades. Mr Moshiri is in the midst of quite deliberately, quite knowingly, accepting another three or four years of stuttering progress will be the reward for the Sammie’s saving our place in the league. Meanwhile he displays the business acumen off the field we expected. Not afraid to see a year already lost on the stadium project its steady eddy territory all the way. Liverpool Council seem bizarrely unconcerned that we are just 7 points off relegation even now and equally they don’t seem fussed that the last few years have re enforced the view that unless something changes dramatically on the pitch, we are going to keep having brushes with relegation that will put those ‘guarantees of re payment’ at serious risk of being deployed. We are nowhere near earning ourselves a £500m stadium. The fans deserve it of course. But the clubs delivering on stadium promises are all in the business of securing on the field success, or at the very least the top six chance of competing for a CL spot each year. I know it will drive the patient esk to distraction. But everything at the club is, as they say in certain parts, arse about face. We are NOT investing in the squad. I don’t care about the nonsense that suggests we spent all that money in the summer. We spent nothing. Or close to it. In terms of success on the field. Net transfer spend is the one true measure of investment of Mr Moshiri’s millions. Of his understanding of what matters here. A negative balance sheet of around £150m, now there’s a thing of beauty. There’s investment that helps build stadiums and gets 60,000 thru the gates. Of course I’m a simple fool and my logic is not, well, logical, as measured by the best accountancy standards and a few economic bibles thrown in for good measure. But you know what? If you get the balance wrong between accountancy and the business of football there is only one loser every time, and that’s why Sam is currently running the gauntlet of the ‘but we are Everton’ brigade, we are better than this football, like we’ve not been utter crap for 25 years and regularly find new ways to shame and humiliate the most loyal and honest supporters around. Even now, as the AGM is about to happen, there is little sign of investing in the football side of the business beyond the importance of wages support. Tosun’s arrival, whilst very welcome, still will hardly take us much above incoming since 1st July 2017. There is no iconic signing, no arrival of four or five to make the difference and undo the abysmal misjudgements of Koeman, Walsh and yes, at times, Mr Moshiri himself whose dalliance with Jim White sums up his inexperience as to how the fans see PR and comms, and his ‘problem what problem’ approach after the summer window closed was shown to be inexperience in the raw when he was forced to sack Koeman or risk making amortisation matter even less than before. We have to be bold. We have to push a few accountancy noses out of kilter. We have to rectify the disaster of the last two transfer windows and take some measured risks. A top quality centre back and left back, a strong and creative partner for Gueye, Not one, not two but three decent strikers to replace Rom’s 25 goals a season because they are just not arriving from our midfield. This cry for help isn’t about rubbishing why the balance sheet, er balancing, matters. We know it does. It’s about balancing that need with what I feel many blues urgently sense, which is that unless we invest capital in our future on the pitch all the financial strength off it will mean absolutely nothing. Because that’s why it’s important for football to beat accountancy at this point in our clubs future else we really, really, will be left behind and I suspect that shiny new stadium is much more dependent upon what happens on the field right now than many will realize when the ‘concept images are revealed at the Philharmonic. Well, thats not yer average dull process orientated AGM we are so used to as blues. There were shocks, talk of “Voodoo”, an end to the Jim White expose phone exclusives, no images, concept or otherwise of the new stadium but, and I’m still struggling with this, news that Liverpool City Council will fund two thirds of the cost of our new home !! Mr Moshiri showed us a video of an interview not with Sky Sports but EFC TV, in which he in my view made up for a bit of lost ground and frankly came acoss as the kindest of benefactors, a sort of Uncle that everyone would like to have, patient, understanding, hard to rattle, wise, and with as he said himself, deep pockets. Im still waiting to see the detail behind this LCC funding. Our big mate Joe Anderson, aka the Mayor, seems to have surprised fans with a statement that leaves us smiling and asking many questions, whilst impressively driving the other lot into a twitter frenzy as “angry taxpayer of Anfield” realises that Big Stand club and it’s fans are not only seeing us plucky blues get closer to a truly iconic Mersey waterfront location, but they are mainly paying for it ! Ta guys, nice one and all that. Ok, calm down, it can’t be this good. It will surely be a bit of financing that clearly is great for LCC. Ownership ? Not clear. But heck this caught us by surprise and annoyed so many from the dark side that it quite made my night. Tho in essence Uncle Mosh creating the impression that Rom left us due to something his mum said and Voodoo influences…..that’s going down in AGM folklore, if AGM’s actually have folklore, Hey let’s create it if not as it’s just too good to lose. For me, exciting tho the AGM feedback was, I heard little to remove my doubts about the way Uncle is spending his dosh. It’s still the wrong way around. It glossed over the disaterous summer window. There wasn’t reassurance that we are going to do more quality business in the window now, and there was a vaugue feeling that it’s all going to take another three or four years of squad building to get us into a place where we are worthy of that shiny new 60,000 seater stadium. Sam got a strange bit of support. Pleasure at recent defensive improvements, delight at his witty autobiography, but again, a vague impression that 18 months really does mean 18 months. Still, it was all jolly interesting and I’m just sitting here praying that there are other surprises in store for us by 1st Feb. This entry was posted in A Bluenose Life on 9th January 2018 by rustyman. EFC squad building, instant analysis now supported by hindsight? The sight of Michael Keane on crutches at Goodison for the Bournemouth game said much about this summers transfer window at Everton. Well it did when you digest the fact that it turned out Jags was also out injured not rested, and that we were left with Holgate and Williams as the only bespoke centre back pairing available. Our we’ll documented failure to replace Lukaku has rightly been the focus. But importantly the failure to land cover and or a first team pick for left side of the defence is serious. Keane has struggled of late but most of us think he’s going to be a top defender. Losing him for just a couple of games is a blow if it means that we face nervous moments watching the gutsy and talented Holgate find his way in his true position of centre back. He was embarrassed by King for Bournemouths goal and he cannot afford to be so obviously second best as a speedy and talented forward like King bears down on goal. Harsh ? Maybe, but this is the Premier League and frankly for me Mason feels like he’s not quite where we expected he would be, but then I’d only ever play him at centre back so what do I know ! We needed that quality defensive cover, hell we needed someone able to show us that Williams and Jags can be the cover. It didn’t happen. Nor did that attacking replacement for 25 goals a season and it’s all got a bit dull but that shouldn’t be allowed to excuse the failure to sort the transfer window as the manager clearly felt was necessary. Oumar and hindsight ? Well he is now making Koeman look foolish and the latters attempts to justify his approach feel a bit weak to be honest. The fans had it right. They gently, then more loudly, lobbied in Oumar’s favour, screaming about pragmatism, lack of depth and well, how much worse could he be etc etc. I wonder if 4th, or 5th or 6th was so out of reach with seven or eight more no9 goals in the last ten games of the campaign that saw us firmly the best of the rest ? Hindsight yes, but it was hardly a secret that many questioned this childish “no locker approach” and pointed to reasonable performances at Hull on loan and Unsworths impressive handling of Niasse as a fairly decent example of how to do things. We are I feel regretting that hugely unbalanced squad, with so many no10’s and so little pace and width but whilst that’s all been done to death it’s not too unreasonable to learn from experience and hope that Walsh is spot on with two, possibly four, genuinely needed re enforcements in January. Before then my gut says I’d love to see us start v Burnley with a very attacking lineup. They defend deep as do we, but they are good at it. Sigurdsson and Klasic wide, with DCL and Rooney up top. Niasse on the bench waiting for the rescue mission seems a more likely outcome than dropping Rooney but his place is under threat now. Gylfi badly needs to play in the centre behind the forwards but I don’t see that happening right now and hope Davies can partner Gueye. Kenny surely deserves another run at right back. With hindsight, was starting the season with Kenny such a terrible risk given how unbalanced and negative we’ve been going forward ? It was a risk of sorts yes, but looking back I just can’t see it having been worse and really think it would have altered our balance positively. Mind you, with hindsight I wouldn’t have wanted the owner to get into team selection with Jim White on Sky, still waiting for the rationale behind that Comms strategy !!! This entry was posted in A Bluenose Life on 26th September 2017 by rustyman. Another disorganised clueless defeat. Feels a bit harsh ? Honestly, I don’t think so and nor do a huge number of fans if the reaction online is anything to by. It’s not that losing to Chelsea and Spurs is a massive shock. It’s simply the manner of those defeats that tells a story we really didn’t expect. So what did we “expect” from a really tough start to the season ? Six straight wins against last seasons best teams ? Nope. I think we expected to show up, to see a team competing, some real signs of permanent top six quality and er, maybe a few shots at goal ? Koeman seems to be setting his team’s up to avoid heavy defeats, but accepting a loss before we’ve even started. Which is crazy, of course, how could that ever be the case but then the manager has already announced we are not finishing top four and also, it seems, top six if the shambles of these two defeats by Chelsea and Spurs are any measure. Our failure to get close to a balanced squad in the transfer window is pretty well documented. Only Mr Moshiri thinks it’s all about players gelling? It’s not. It’s about a total mind blowing failure to replace by one or yes two, strikers, the 20-25 goals a season we lost when selling Rom with two years left on his contract. It’s also about a failure to see Williams simply isn’t good enough, and that on top of the need to replace him we also badly needed left sided cover. But there you go, we did “good business” apparently because we spent £150m, on a clutch of guys who all play in the same position. We’ve ignored the loss of £109m worth of star and squad players. Somebody has got this all wrong. No real goal threat, No pace, no width, no defensive cover. Is it Walsh ? Or Koeman himself ? I suspect the latter. Will it get better ? Well I’m not too confident of avoiding a tonking at Old Trafford but it’s actually a great opportunity to turn things round. A win there will immediately boost confidence and shake things up. It’s a big ask tho isn’t it and one that won’t be achieved by turning up, like we’ve lost before the kickoff. A lot depends on the Atalanta result and performance. But allowing for some changes after Thursday this would be my team for UTD….. It is risky with two young players in the back four but Kenny has to be given a chance sometime soon so why not Old Trafford? Holgate is a centre back, end of, so play him there. Gylfi would play just ahead of Davies, Gueye and on the right side, and I’m hoping that DCL and Rooney can get some joy from Utd’s defence. Pie in the sky ? Well we will never know as it’s just too competitive, too attacking for Ronald which is a shame but then maybe we can sneak a draw by parking the bus, as of course that’s worked so well for us in the past. This entry was posted in A Bluenose Life on 10th September 2017 by rustyman. 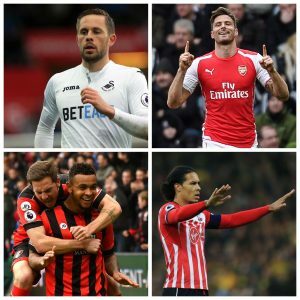 Where does the 2017 summer transfer window leave us? Was it a mess ? 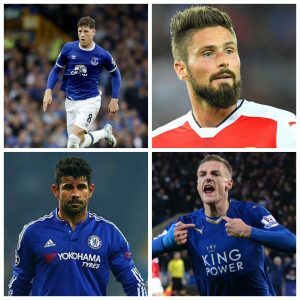 Where does the 2017 summer transfer window leave us ? 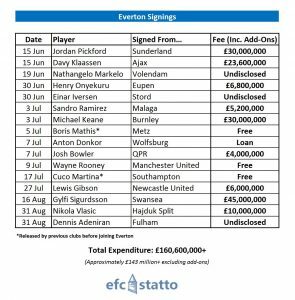 Well thanks to the very helpful “efc statto” and Twitter i think the table above gives a good idea as to how the Rom, Geri and Tom Cleverly sales money has been spent and the quick witted amongst you, well pretty much anyone really, will get the hint. It seems we’ve managed to spend around £160.6m and received income from sales of approximately £109m if you allow £10m for the Rooney “free transfer” ? So net capital spend in-seaon is £51.6 and had the Niasse and of course Ross B transfers gone thru then wed be closer than Arsenal to a zero net outgoing, which takes a bit of doing these days given the Gunners current set of issues. Overall Is this a negative assessment ? Yes. Does that mean we are doomed to finish below the clubs who the media have suddenly decided were much more canny than us in the market like, er, West Brom and spookily, Swansea ? Almost certainly not tho things are looking a bit iffy. Does it mean we’ve done more than keep,a steady seventh placed pace ? There’s the question that feels very hard to answer today as we head out of the international break towards a possibly defining moment, the clash with Spurs at Goodison. Its been said already but it’s worth repeating. What went before deadline day mania still feels like reasonably good business. As it was happening it felt extraordinary. Exciting. Ground breaking. But in part this was down to the absurd scale of the transfer fees in a football world probably at the top of a transfer market curve. The hugely inflated fees paid are matched by what you can get for some very average players. It’s a cycle, it may not quite be over but let’s see. Truth is the players we have bought in feel like top sixish quality. The one player we let leave feels like a world class forward who whatever you feel about him as a person, which frankly matters not a jot, represents 25 goals a season, something most premier league clubs actually never, ever, get to enjoy. Fact : we have failed to balance a squad full of talented midfielders and now three no10’s. The manager knows this and could see the urgency of bringing in a top class striker and left sided defensive cover. Worryingly it appears Mr Moshiri disagreed and seemed to indicate in his cosy chat with Sky’s Jim White aka EFC Communications Director, that he’s picking the team for the Spurs match. Ok, OTT but there’s something not quite right about the sub text of that very public assessment of our transfer window. We are left with an unbalanced squad that has little pace to worry defences, hardly any aerial threat in open play, questionable width, and a back line that is bolstered by the impressive Keane, but has some aging and let’s be honest, really slow-to-turn centre backs. We lack goal threat, at least that’s the early evidence, and somehow we have taken two months not to replace Rom. Dress it up however you want. Tell me those 25 goals will be shared amongst Gylfi, Wayne, and Klassen from midfield etc. It’s a very tough ask in this league. Worse, lots are missing the point of the general dismay at failing to land a striker. It’s very simple, he is the pivot for those midfielders, the target man for Gylfi, a player to bring others in and to hold up the ball,at times of pressure. He’s the guy who helps enable those clever midfielders and a classy no10. We are not Barcelona. Playing without a recognised striker isn’t us ok. Sigh. Defensively it’s interesting. Pickford already looks like a top, top, keeper. His commanding presence is refreshing. His distribution from the back impressive. But in front of him those slow centre backs, Keane apart, are willing and vastly experienced, but truth is Williams is not the player I’d hoped he’d be and Jags, surprisingly, is still here doing his usual committed job but should have been replaced by the likes of Harry Maguire who somehow we let wander off to Leicester, a missed opportunity if ever there was one. There is simply no effective cover for Baines with Mori out and if Bainsey gets injured it’s Cuco Martina playing out of position at left back, think about that for a while. Deep breath. As Phil Kirkbride has said in the Echo, it’s not the sudden end of the season after three games. How Koeman’s reacts is now crucial. He is paid six million big ones a year to cope with this type of situation. My guess is that he will, at last, give the clearly talented DCL a proper run in the no9 slot. I think the lad will do well actually. Just not as well as a Giroud or a Batsuayi. But there’s a chance that this is DCL’s breakout season and he may take the league by storm. Fingers crossed. Klasic could also be a game changer and a pleasant surprise as his arrival passed largely under the radar whilst we were all howling about the failure to buy those two players. I think Gylfi is a superb buy who will do the business once match fit and I expect Sandro to improve, as will Klassen. Rooney ? Well until the news broke about his disgraceful drink driving nonsense I was hugely encouraged by his form, his leadership, his experience, his goals. Not so sure where’s going now but more of that in another blog….. The Ross Barkley situation is damaging. For him as much as for us. Personally I’ve given up on him. He’s had brilliant support and sometimes some stupid boo boy type reaction that he’s taken to heart. His form has been so inconsistent it’s hard to know if we have lost a world beater or a player who just isn’t anywhere as good as he thinks he is. The tough love thing from Koeman has I think back fired. Ross is a child like sensitive soul and I’m not sure comments that made the boy look like the scapegoat for some aweful performances was the right approach. But what he’s done now looks so bad. So calculating. So unforgiving of a club and fans who have been there for him when he was badly injured or just playing like an idiot. I’d like to think he’s going to suddenly issue a statement this coming week that says sorry for wanting away, says he’s been a dork, tell us he loves us, signs a contract and swears to get fit and be there for the team and it’s supporters. More likely he thinks he’s off in January for a cheap ten mill. If that’s the case I’d make him train alone until 31st June 2018, never play him in a competitive match, destroy his unlikely World Cup dream and show him he’s not bigger than our great club. Harsh ? Maybe, but no harsher than watching £35m disappear and being treated with contempt. So it didn’t quite happen, the golden transfer window that was to change everything. I’m not sure the money was actually there to be honest. It will seem like it was and let’s be clear, as the clever “amortisation” accountants will confirm, Mr Moshiri has signed off on a yearly commitment which has risen from £30m to over £70m in terms of ongoing player costs. That’s a huge commitment. But in terms of free flowing “capital” investment in the squad? I’m not so sure. We seem to have almost balanced the books and the sale of the errant Ross, McCarthy and even Niasse in January will get us close to that. Where’s a £100m injection of genuinely new money, that isn’t reliant upon sales income ? That’s the kind of added value that makes a squad grow quickly in quality and depth. The new stadium looks like a sensational development. There’s lots to like and savour about our U23 set up so well led by Unsy. My gut tells me we’ve not quite done enough when we thought it was all about to get really, really good. A few injuries and we are in more trouble and Ronneys pathetic behaviour just highlights how quickly things can change. But balance those doubts with thoughts of the likes of Gylfi, Klassen, Sandro, Pickford, Keane and yes DCL really turning it on, AND then remember we get Seamus and Bolassie back before 1st December. It may actually be ok and I’m going with that because I can now watch us from the best view in the house at the Old Lady and I’m desperate for it to be a happy view !!! This entry was posted in A Bluenose Life on 2nd September 2017 by rustyman. Anyone, preferably two will do, says the headline but to be honest the next four days of the summer transfer window will define Everton’s season, not the business done before. Frankly I can’t see how it’s just two new arrivals we need when clearly we are at least four or five players short of a squad capable of coping with the demands of competing in four competitions. There was some real rubbish spouted on social media after our pathetic capitulation to Chelsea at Stamford Bridge. The Positivity Police were out in force again, defying reality and refusing to face an uncomfortable truth. Namely, that despite some clearly decent arrivals, we’ve let the best striker in the country or close to,it, depart for Utd with, it seems, not a clue how to replace his stunning 25 goals a season. It’s been two months since Rom left and now we seem to be in panic mode trying to replace him, mainly because Plan A, find the goals from midfield, already looks doomed. According to some we lost at Chelsea because we were tired, which reflects a tough week but is just such a scary thought given we face many similar weeks between now and Christmas. Yes Chelsea are quite good. Yes we’ve had a hard week. But it feels like we arrived at the Bridge in exactly that frame of mind, and Koemans setup meant we invited waves of pressure which surprisingly only produced two goals. This was a desperately poor performance from an Everton squad which has to cope better with injuries. But there are horrible gaps in this squad and yes that’s even with a lot of money spent. There is no pace, at all. We have little width and now the manager has fallen out with Mirallas. We need a left sided centre back who can somehow also be a cracking left back. And yes we need a no9 who can at least manage 15 or so goals a season. Me ? I think we must have a Vardy type player who can get wide right and play up top if needed, off a strong centre forward who can actually hold the ball up. We just don’t have enough until Christmas and the return of Seamus, Bolassie and either Ross himself or if he’s sold, his replacement, will make a big difference. But by then the damage may have been done. It honestly isn’t being negative to call it as you see it. Things are not great. The hype has been magnificent but that’s what it is, hype. We’ve not really played well yet. Rooney looks clever and hard working and has goals in him alongside a superb commitment to his favourite club. Gylfi is well over priced but a class act when he gets fit. Keane and Pickford very sound buys. Sandro ? I’m unsure about but let’s give him the time he deserves. Klassen the same. And then there’s the enigma that’s Ross B. I don’t think he wants to leave but he got fed up being slated in public by his manager and in truth his in and out form didn’t help his case. However, am I the only one thinking he might yet turn things round if he stays ? But if he’s sold then that money, and a lot, lot, more must be re invested by 23:00 on 31st August because we honestly will not handle what’s to come without four or five quality arrivals. 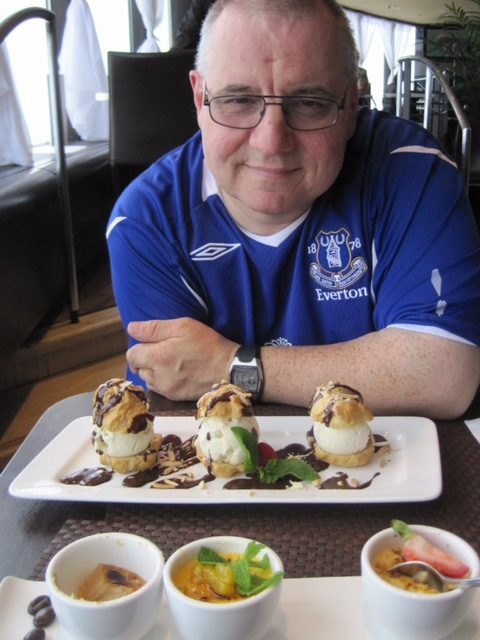 This entry was posted in A Bluenose Life and tagged Chelsea, Chelsea two Everton nil, Everton FC, Koeman, Ross Barklay, Summer transfer window on 27th August 2017 by rustyman. Yep, the Everton Positivity Police are well and truly back after the second leg against Rubonberok. The PP operate on Twitter mainly but do of course appear on Facebook and a fair few of most popular Everton supporter sites. Their objective is to hunt out any, and I mean any, comments about the team (and occasionally the Club) that are anything less than what is considered “100% positive”. It really doesn’t matter how balanced a view is being taken, how considered the opinion, and however keen / fanatical / committed / loyal the source of the view. If it’s not wholly “positive” your immediately labelled a glass half empty type rather than the half or nearly full variety of blue. Ive had enough of this tosh. Watching the game on ITV 4 and desperately trying to avoid the inane commentary of Sam what’s his name and Andy Townsend, I did what I usually do whilst watching a live game on the telly. I wandered onto my Twitter feed which is pretty much nearly all blues, and did what us social media managers like to call “engagement” or you will also recognise as “tweet”, “chat” “argue” “moan” “Cheer” “debate” and “shout at the Tv and iPad Pro, all at the same time. I joined what I have to say felt like a massive majority in voicing, ok tweeting, thoughts about how dreadful a performance that was for 80 minutes. I may have suggested that our generally encouraging transfer window, so far, was honestly only half a job. I could possibly have mentioned a thought that we have lost an almost guaranteed 20-25 top level goals from Rom and seem very likely to lose the frustrating but still, to me, clear talent of Ross B, yet we are nowhere close to replacing these guys, certainly Rom. I think I then became emboldened as the team continued to labour against the European equivalent of Forest Green Rovers – no offence to those eco warriors and small club going places – and did suggest that we haven’t seemed to have a strategy in place for coping with Room’s departure and the new look squad, which has a fair bit to recommend it, looks horribly unbalanced. I wandered into territory that clearly drives the PP wild, by adding that we’ve stocked up on decent midfielders, look like breaking our transfer record to add another very good one soon in Glyfi, but honestly don’t have a quality target man. True DCL, at last played where he should only be played, as a CF or one of two up top, looked great for ten minutes and scored a really well taken goal. But we’ve talked about Giroud for so,long now it’s as if he’s signed and is about to make his debut. He hasn’t and frankly it’s not looking likely but we can still hope. The keeper looks worth his £30m and the rest. Keane will I’m sure be rock solid. Sandro looks like, well I’m not sure if I’m honest but I think he will get a few goals and cause defenders headaches. Klassen went from world beater to anonymous over two legs but then superbly set up the DCL chance. Lots to come from him I’m sure. So yes there’s good things going on….but….and here it is PP…..we are still some way off securing the balanced squad Koeman needs to compete on four fronts but crucially, to have a pop at that fourth place and or a trophy. The transfer momentum has stalled, a bit. There’s a danger of unfinished business and a squad short of that top notch centre forward, a mobile centre back, and pace….yes pace…..on the wing to deliver some width we are so so missing. Ok, is that really “negative” ? Have I suggested we’re doomed ? Is it so unrealistic to expect continued spending given that we are likely to see incoming fees top £170m in just ten weeks ? Yes I know about amortisation as so brilliantly explained on the superb new “The Blue Room”. But I don’t care, fees received has to be significant and we can surely afford to spend £270m if getting £170m in ? Anyway, that’s another debate. But here’s the thing. It is NOT being negative to call last nights “performance” poor. It was rubbish. It’s early, yes. Apparently our players are not up to speed in terms of fitness, touch, etc but the season starts in eight days. And in case anyone has forgotten we have the toughest league start in living memory, well mine anyway. So, dear PP folk. Ease up a bit. Pragmatism is fine I get that, I’m a bit of a pragmatist myself and yeh a bit glass half empty but look, were not there yet transfer wise. It’s not seen us deliver a balanced squad and frankly we look a bit ponderous, woefully short on pace, width and strength in the air and finishing. We need to complete the very decent job done so far and quickly. That’s all I’m saying, and I think a lot of other blues right now. Mr Moshiri is clearly a NSNO kind of guy and I’m thinking he will have spotted what we have and act, soon, to get that balance right. 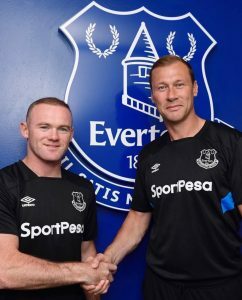 COYB says he in incredibly positive fashion !! This entry was posted in A Bluenose Life on 4th August 2017 by rustyman. Two out of Four would do Everton ! Yes, two,out of four of these chaps would do very nicely Everton. Next week should see us get close to securing most of Koeman’s transfer targets. He clearly sees Sigurdsson as a crucial part of the balanced squad he’s creating, but in truth the guy is more than that, he’s a key part of the plans for the best 11, I’m sure of it. He’s horribly expensive if it comes off. £40m plus add ons. It’s crazy money but I’m convinced he’s actually THE part of the jigsaw, with his excellent passing, crossing and of course dead ball expertise. It needs to happen before the first game of the season given our incredibly challenging start. Olivier Giroud is interesting given the likely fee of £25m for a 30yr old which seems excessive but this is the fourth highest premiership goal scorer in recent years, and a forward who is great in the air, holds the ball up very well, has a range of passing and is a right nark. Just what we need and we do need at least one additional striker after losing the gobby git. Olivier is a bit slow we are told. Well he’s not a sprinter that’s for sure, but somehow he’s scored a lot of goals. Play to his strengths comes to mind. Id still be surprised if Wenger lets him leave, particularly with Sanchez constantly rumoured to have had his head turned….apparently….tho in which direction who knows. If he arrives he’s the favoured option but Josh King offers a younger, faster, goal scoring alternative. He’s a punt of course because last years breakout season at Bournemouth followed some ordinary years but he’s got something about him and no mistake. £20m is last years £10m I guess, so he’s a bargain ! Will only happen if Giroud looks like staying at the Emirates or Koeman’s refuses to leave it until 31st Aug deadline day. Ok I will be irritating everyone throwing in VVD when he looks certain to reward alleged tapping up with a move to a club struggling to make any proper impact on the transfer market these days. But you can dream can’t you and this guy, tho damaging his brand with the striking not playing thing, possesses the lot for me. Everton dithered and missed him at £10m a few years ago. But he’d give us a three at the back option that we know Koeman’s likes, not to mention pass and create capacity from the back. Not happening is it but even the click bait mentions are devoured like even a 1% chance of signing him should be. Sigh. This entry was posted in A Bluenose Life on 23rd July 2017 by rustyman. Wayne Rooney : He’s back, now it gets interesting ! Wayne Rooney. I well remember him leaving. I heard confirmation on Radio Merseyside, rang my mate John and had a blazing row. I was disappointed but already wondering who we could buy with the money, particularly as I was of the view that the four decent quality players it might produce would, overall, be of more value to a squad badly in need of a lift. John, as ever a much more scholarly Bluenose, vented his spleen and proceeded to devastate my argument with facts and figures yes, but more emotionally shouted, most unlike him, down the phone about the loss of a decade of goals, huge world class potential and the simple fact that we’d very easily said goodbye to a player who would light up the league for a long long time. He was right of course, well about the potential and the lighting up thing. Later that night the other key partner in our blue triangle, Allen, told me I’d hadn’t a clue about Rooney and that he would lead England and we would be a laughing stock for letting him go. Somehow my further, and I thought rational argument, about how do you stop him ? fell on deaf ears. The emotion of the apparent betrayal from a lifelong blue was way too raw, and remained so for a long time. It hurts that I can’t call up my two closest friends in the world to apologise for being very practical and dull, and celebrate the return of a hero. Both have passed away, I miss them every day, both would have been made up to see Wayne back and without doubt John would have showered me with stats about what even a now 31 year old could bring to our exciting new project. If my mates and even I can forgive and forget, then any blue can. Sorry, but it’s time to be practical. Rooney’s return makes a great deal of sense. One disappointing season at Utd, part of two years worth of a poor Utd squad and a poor bit of management from two guys who in truth didn’t get much of a chance at Old Trafford, well that doesn’t make Rooney poor. He will improve the squad, significantly. He will offer hugely valuable experience, creative options and Koeman’s much required ‘productivity’. He will score a lot more goals than in his last two years at Utd. Not that difficult I accept and not anything like the moron we’ve just let go. But it’s clear Korean expects goals to be shared around the squad, not just from one very clever but horribly disrespectful player. Rooney will help younger players along. He will add much to the clubs already booming public relations and increase our profile abroad. He’s still a star. He has to behave like the consummate professionals we love to have at our great club. He will work hard I know. He loves us, of that I’m sure and it shines out in every smile just what it means to him and his family that he’s back home. So, Rooney is back and it’s time to put aside any doubts. Accept it for what it is. A smart move, hopefully, but just part of what feels like a genuine revolution in which, suddenly, every day is about Everton and quality and a new stadium and, well, a lot more besides. 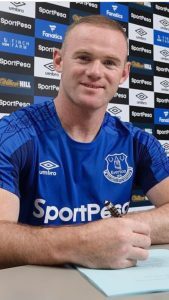 Rooney is back but so are Everton. It really is happening and now all that’s needed is to translate all this excitement to a dawn that isn’t false. I’m with the project and so should all blues be. It’s about time I eased up on the practical stuff and just let the emotion take over and enjoy the ride ! This entry was posted in A Bluenose Life on 11th July 2017 by rustyman. A wasted season. Harsh ? Unreasonable ? It was after all a big improvement on 11th (twice) under Martinez and we did finish fifteen points clear of the rest, albeit also fifteen points off fourth place. But I can’t get away from the fact that despite the significantly improved financial resources at the club, Everton had two disappointing transfer windows, with January the real killer. We just wouldn’t gamble, take a measured risk, and splash out on a centre back and forward to add to Morgan’s excellent capture. I’m convinced that had we been prepared to address the serious flaws made obvious by that pre Christmas “run” of one win in ten, then our improved form post mid January could have been worth more than how we have finished. But we didn’t and the centre back weaknesses have been exposed, the lack of back up to Lukaku emphasised and the arrogance that we thought we had cover at right back highlighted in cruel fashion. I know many don’t seem to agree, thinking that Schneiderlins arrival was all we needed, and then going on to laud the removal of the “dead wood” which was always going to happen in the summer anyway. For me this has been a season of utter frustration and missed opportunities. I don’t think Koeman had to be given a year to assess the squad. I think the cup exits were both really poor and in particular the Norwich game cost us momentum and totally derailed a decent start to the season. In March there was the outside chance we could have surprised ourselves and kicked on to a fourth place finish. Unlikely I will grant you. Undeserved on most quality assessments maybe, but it was there, tantalisingly within reach but we went to Spurs and didn’t turn up and embarrassed everyone against Liverpool, again. I get it that we aren’t really ready, well obviously, not ready at all. But a CL qualification would have brought us more than another financial boost. It would have given us a head start on the post Martinez recovery, made us much more likely to attract the kind of quality in the summer our money can buy. I don’t accept it was never on. Chelsea and Spurs apart, everyone else above us has stuttered and failed to impress. City have got it together late on but they have had a poor season by their standards. Liverpool really have been lucky to get fourth, whilst Man Utd and Arsenal have drawn too many and frankly looked jaded for a long time. We just needed to take a measured risk and give it a go. But here we are, hanging on to some bright spots. Tom Davies has done really well but clearly needs a rest, as his aweful 26 minutes at Arsenal showed. Morgan is hugely impressive. Lukaku outstanding despite the fact that some have bellowed for his sale due mainly, apparently, to his inability to score against the big clubs…Kane and Sanchez have patchy records against them too, and…..his disgusting failure to win games on his own. Sigh. Only at Everton can we chase away one of the best goal scorers in Europe. Williams has been poor, a shadow of the guy who arrived from the Euros as a strong defender and even stronger leader. He is turned so easily, lacks pace and frankly is terrified when faced by runners. With Jags labouring and Holgate played, crazily, at right back so many times, the defence may have improved on a terrible record in 2016/17 but when you add that we haven’t got a keeper at the club it’s not encouraging. Time to put it all behind us and pray for a total overhaul in the summer with (somehow) two high quality centre backs arriving, a top class keeper, right back cover, replacements for Ross and Rom if they depart, and in truth, at least five other genuinely strong additions to a squad that is desperately in need of balancing the “promising” with the “ready now”. I will feel a lot more positive with a bit of sunshine around and a lot of early signings. This entry was posted in A Bluenose Life on 22nd May 2017 by rustyman. Ok maybe a hatrick of woefuls is a bit strong. West Ham nil nil, yep, woeful. The Chelsea home defeat was not quite woeful until the last thirty minutes when it fully qualified as a “woeful”. Still this classic Everton defeat against relegation threatened Swansea really did deserve its “woeful” description and frankly it wasn’t a surprise. We really didn’t turn up until the second half. Barry, Jags and the often hapless Stek combined to concede a poor goal. Holgate again looked decent in defence but just lost going forward. This meant that for the third game in a row we had little width down the right and it impacted the whole performance going forward. I thought Mirallas did ok and certainly seemed bothered, as did Tom Davies throughout. But the service to the front men was generally terrible, and on a day when Rom looked like he was mentally adjusting to throwing his shirt into the crowd and saying his goodbyes at Goodison for our sizzling last home game of the season against Watford. What was Koeman doing playing Holgate at right back and leaving Kenny on the bench when surely the time was right to maybe play a right back, at right back (innovative I know) and try Holgate at CB in place of Jags ? Williams wasn’t great was he. Boy was I was wrong on this guy. I liked him a lot. He seemed a fearless leader. A ball winner. He had experienced a better than decent Euro’s. But almost from the start he’s struggled. He gets turned way too easily. He’s been beaten in the air way too often. He lacks pace. He just isn’t the CB I expected and because of that we now need to buy two central defenders at absurd cost. What worries me is that these last three games won’t have done much to endear us to potential high quality recruits. Who amongst the best will fancy us ? It’s going to be a short hard summer methinks. But you never know Walsh may have it all sorted and there are some bargains on the way as well as at least four top quality additions. More if Rom and Barkley depart. One thing is for sure it’s not going to be easy as it now seems we are essentially having to rebuild, again, when previously we thought a couple of top imports would do the trick. Not great really. Still, roll on the pre pre qualifying round of the Europa in the third week of a July. This entry was posted in A Bluenose Life and tagged Koeman, Luksku, Swansea versus Everton 6th May 2017 on 6th May 2017 by rustyman. 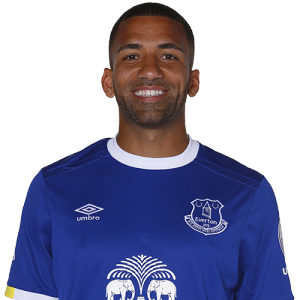 It’s hard to say what you feel about the Daily Mail’s treatment of Aaron Lennon as it tweeted about his mental health. Hard because you want to scream, rant, swear, a lot, and just shout to the world “how can someone’s mental health concerns be in any way linked to his or her salary? What has money got to do with anything here ? Nothing of course but the Daily Mail has no time for what is right or wrong, tasteful or horribly distasteful. It is a cringeworthy publication, hated by many almost as much as the S*n and respected only by those whose politics it’s promotes. All blues can do is wish Aaron well, offer him our total support in regaining his health and coping with something that is so hard we often find it tough to talk about. But mental health needs to be on everyone’s agenda. Mental Health care desperately needs better funding and more accessible provision. Mental Health issues are very neutral, people from all walks of life get affected, rich and poor, famous or, well, just like pretty much everyone you know. There is tho something very positive to come out of that disgusting Daily Mail tweet about Aaron. It is the amazingly universal condemnation of the Mail, by thousands of people of all backgrounds who almost instantly, and as one, recognized the abysmal attempt to score points off someone facing serious mental health concerns simply because they are in the public eye. Maybe, just maybe, the Mail’s horrible actions will have given publicity not to them but to the fact that anyone can face mental health issues, anyone can need your support to beat this still quite shadowy disease. Let’s talk about it more, try to understand how best to help and support those whose mental health is a constant, every day challenge. Most of all get better soon Aaron, every blue is behind you. This entry was posted in A Bluenose Life on 4th May 2017 by rustyman.